And I don’t mean the elections. We just returned from the Big Island and guess we timed it perfectly to miss the horrid heat wave. Unfortunately we couldn’t miss the Lakers dumping the championship in that last game. Did they even show up? Good thing we were enjoying mai tai’s by the surf to ease the pain! (Honestly, basketball is not even on my top 1000 things to do in life. Much happier now that Wimbledon is on.) My favorite part of this Hawaii trip was the two hour hot stone massage, then being on top of a steaming volcano and walking through an old lava tube. Photos to come! 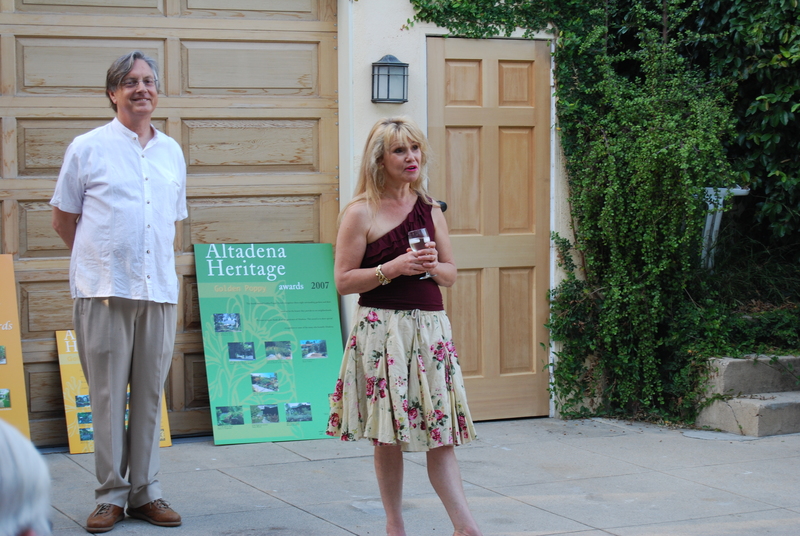 THANKS TO THE ALTADENA HERITAGE SOCIETY, MICHELE AND MARK ZACK, AND HOSTS ANITA AND CHRIS DAVID FOR A LOVELY GARDEN PARTY ON SATURDAY TO CELEBRATE AND PRESENT THE 5TH ANNUAL GOLDEN POPPY AWARDS FOR OUTSTANDING GARDENS. Congratulations to the 2008 Golden Poppy Winners! Steve Labrecque, 3346 Canyon Crest Rd. (former home of our favorite nursery family, the Nuccios, confirmed by Jim Nuccio this morning). Look for the distinctive staked plaque in the winners’ gardens. And to those who are holding on to their old ones, the Altadena Heritage Society would love it if you would turn them in for the new winners. Maybe if we could raise enough money for the AHS, each year’s winners could have one with the year they won and keep it forever. As it is, every winner receives an official certificate to keep. Much discussion was made of water bills. Those with “water wise” gardens boasted as low as $30 a month. And let’s face it, water isn’t going to get cheaper or more plentiful. Have you gotten the latest letter from Lincoln Ave. Water? So it’s getting time to revert to gardens that reflect our “real” climate, not the one we wish it was. Or the one it has been, fed by diverted water from other areas that were much more green than they are now. We’re going to be making changes at our house. Love my cottage garden, but now it’s time to achieve that feeling in other ways. Decomposed granite anyone? The David’s home is historic, having been designed by G. Lawrence Stimson in 1923. Stimson’s credits include many in Altadena with his most prominent accomplishment being the Wrigley Mansion, now, of course, home of the Tournament of Roses. They have been restoring the Mediterranean style home with Deco touches since buying it about 10 years ago. It’s a beautiful home in the remaking. Here’s the word from my friends in France. We’re still way behind what they’re paying. “This side tooooo is getting killed with the gas prices. The trucks have been doing snail drives in & around the main “port Towns” to protest the price. And the poor fisherman can not make any money with the price of Diesel…..
We figure almost $10.00 Per gallon here..
We have to do very little driving & boy you talk about getting cabin fever !!!! Ok, I wish I had been documenting the price increases over the past year. In Death Valley in March one station was selling gas for $5.50 a gallon. But they’re out in the boonies so it wasn’t that nuts. On May 27, near Oakland, we thought $4.19 for regular was pushing it. We got home to see it was that price here, too. I’ve seen the prices increase from evening to the next morning and from that morning to that evening, so two increases within 24 hours. Yesterday the AMPM on Lake was $4.27, today it is $4.33. We’re driving slower, using less air conditioning, planning trips a little better, probably foregoing a July 4th trip north. Just thankful we work near home. What are you doing to protect your pocketbook? Here is a link to the Green Pasadena Leadership Summit program taking place at the Pasadena Convention Center this weekend. This event focuses on green technology, with speakers from JPL/Caltech (Dr. Charles Elachi) and many more.